At my recent visit to the beauty supply store I realized I needed a shampoo that would give some bounce to my fine and naturally oily scalped hair. I do love the Tresemme keratin shampoo but it has a tendency to flatten my fine hair while making it look straight and tamed without much frizz. 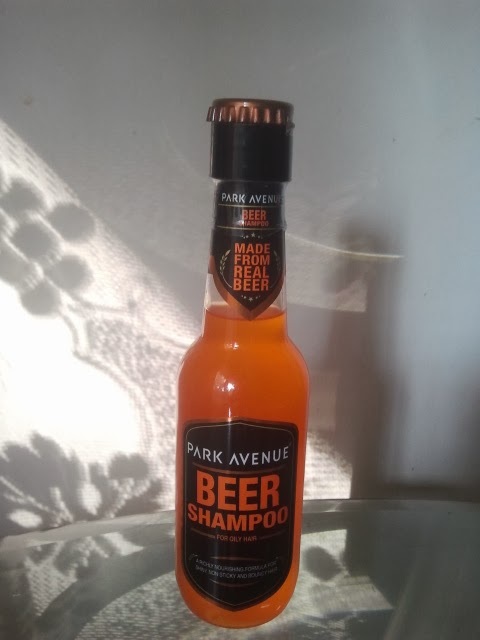 Thankfully, I noticed the much raved about Beer Shampoo by Park Avenue at the store. The bottle comes in just one size and looks exactly like a pint of beer. My beauty experiments have included using beer on my hair for the last rinse and the results have been amazing- hair with a bounce and shine. This shampoo did the same in the very first wash itself. I have never used a shampoo that has shown me results in the first wash and this totally made it worth a review. You don't need much product and the whats amazing is that though this is meant for oily hair it doesn't give you that feeling of stripping your hair off its natural oils. Also I am not a person who likes to use shampoo twice like most others. Like I have mentioned earlier it leaves your hair with a beautiful shine and bounce once it is naturally air dried. The only problem that one might have with this product is the beer smell but that also is a minor issue as thankfully the smell doesn't remain on the hair once rinsed. So if you don't mind bearing with the smell in the shower, here is a fab product for all those like me with oily & fine hair.